Centred on improvisation and new music, Emulsion will be hosted at mac Birmingham for its seventh edition on Friday 2 and Saturday 3 November. As a music festival that celebrates the adventurous spirit and the open mind, Emulsion offers a melding of contemporary music, drawing from jazz, classical and folk traditions. The brainchild of saxophonist, composer and Birmingham City University PhD student Trish Clowes, Emulsion VII will feature jazz pianist and composer Alexander Hawkins as its guest artist. Emulsion provides a platform for contemporary composition and improvisation, and fosters collaboration between like-minded musicians. Clowes founded Emulsion in 2012 and, in 2016, Tom Harrison came on board as the festival’s Artistic Director. At the heart of its melting pot of musicians and ideas is the Emulsion Sinfonietta, a colourful line-up of trumpet, violins, saxes, oboe, cor anglais, cello, bassoon, electric guitar, bass and drum kit. The Emulsion Sinfonietta will perform on the evening of Friday 2 November along with Alexander Hawkins. A happy by-product of several Emulsion festivals, the Sinfonietta has premiered 17 new works to date. Two of these works have gone on to win British Academy of Songwriters, Composers & Authors (BASCA) British Composer Awards in the Contemporary Jazz Category (Joe Cutler's ‘Karembeu’s Guide to the Complete Defensive Midfielder’ in 2016 and Cevanne Horrocks-Hopayian's ‘Muted Lines’ in 2017). 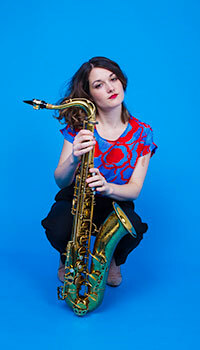 As well as being recognised at the British Composer Awards herself – winning in the Contemporary Jazz Composition category in 2015 – and a former BBC Radio 3 New Generation Artist, Trish Clowes is one of 50 STEAMscholars at Birmingham City University. The research of the STEAMscholars is funded as part of the institution’s £3 million initiative to create new subject knowledge and to power cultural, societal and economic improvements locally, nationally and around the world. “I am very excited to present this seventh edition of Emulsion, which is also acting as a key case study for my PhD research. We have wanted to work with Alexander Hawkins for some time so we’re thrilled to have him as our special guest on Friday 2 November. As well as performing with us, he will present some of his own music and a work by the legendary composer-saxophonist Anthony Braxton." I am also excited to present ‘Emulsify’ on Saturday 3 November. This new immersive event, debuted at Emulsion VI, will allow audience members to explore morphing between the roles of listener and performer, and is a product of the illuminating research I have been conducting with local audiences, both for Emulsion VII and Emulsion VI in Shrewsbury earlier this year. Clowes has been working closely with fellow PhD candidate Percy Pursglove throughout this project and he will also present new compositions during the festival related to his own research, which is focused on the relationship between contemporary classical and improvised music. 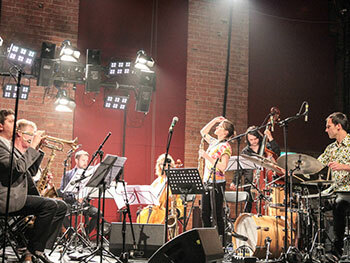 Clowes is part of the Jazz Studies research cluster at Birmingham City University, which is led by Professors Nicholas Gebhardt and Tony Whyton, and Dr Nicolas Pillai. Emulsion VI took place earlier this year at The Gateway Education and Arts Centre in Shrewsbury. This followed last year’s festival at mac Birmingham, as well as three successful events in London, and one in collaboration with Cheltenham Music Festival.